In just 23 days, you can circumnavigate the world on a privately chartered jet. Check off most of your bucket list in one fell swoop. Why all the buzz about these tours and why are they selling so well in a murky economic environment? In 1999, T.C. Swartz and his sister Charlene Brannon had the idea to reconfigure a commercial jet for all business class private group travel. They then offered a highlight itinerary of the world, for 78 guests, to the American Museum of Natural History. Thus was born the most successful company (under several successive names) offering private jet group travel. It is now known as TCS/Starquest Expeditions. Their current “standard” Around the World (ATW) itinerary follows this routing: Florida, Machu Picchu, Easter Island, Samoa, Great Barrier Reef, Angkor Wat, Taj Mahal, Pyramids and Luxor in Egypt, Serengeti Plain and Fez, Morocco. This is a world highlights tour for first timers. Another that was just introduced this year and has sold out two departures is one focusing on just Four Seasons properties around the world. That sold out itinerary is here, but the just announced Four Seasons ATW for 2013 will run from Seattle through Tokyo, Hangzhou, Shanghai, the Maldives, Istanbul, St. Petersburg, Marrakech and New York. But should you consider any of these expeditions? Let me lay out the pros and cons. The pace is quick. I was one of the younger ones on the trip and the first few days were wonderful but tiring. Heading west is much easier time zone wise, but it is still hard. The first stop after leaving Florida on many of the trips, including mine, was Cuzco with a visit to Machu Picchu. So you are hit with altitude in addition to jet lag. Drinking lots of coca tea helped a lot, in fact it made everything quite rosy. One of the longer flight legs follows, to Easter Island, but after that the pace lessens. Still it is not a leisurely trip by any definition. True, you can manage your time on land to recover, but with only two or three nights at each stop, who would rest? The limited amount of time in each destination is also a negative, but you only have 23 days. Many travelers use this trip as a general overview of world highlights to pinpoint where they might like to return for a lengthier stay. When on land, there is little free time to just wander and shop. You will meet with locals, but these are orchestrated and prearranged, of necessity. Impromptu exchanges are few and far between. You will see the highlights, enjoy excellent local meals but have only a little unscheduled time. The Boeing 757 that is now used for these trips was originally configured to seat 233 travelers. 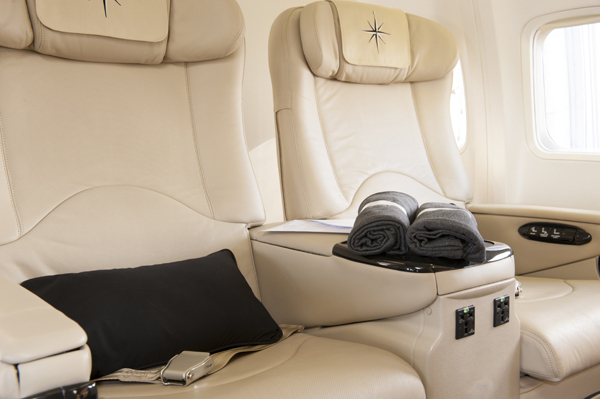 Your plane seats 78 guests comfortably but the seats are not lie flat. You will never fly overnight and are always busy while flying so they are sufficient but not the level of business class you would find on many carriers today. These trips maximize your time on the ground because everything, and I mean every tiny detail is attended to. You never touch your luggage after leaving it in your room. When landing in a new country you will find a beautiful packet on your bed, usually locally designed, and filled with pocket money for your stay. So no worries if you need some change for a diet coke or postcard. Touring on land could be a negative with 78 in the group but it is not. Every stop offers a wide variety of customized options so your time inc each country can be personalized with a small group or even on your own. Of if you wish to visit a nearby site instead, it can be arranged. You have your own doctor on board. This, as they say, is priceless. He or she is good to have, both for the everyday cough or the real emergency should you need to visit a local hospital. Good to be in the company of an expert who speaks your language. Finally, I should put aside the pros and explain the cost, which is not insignificant. For the 2013 Four Seasons trip the cost is $70,950 per person and $8650 additional if you want a single room. Another more recent player in this market is Lakani World Tours. They currently offer one ATW jet tour and there are a few major differences. Lakani’s jet is the same size, but configured for 50 passengers, they have fewer stops and more time at each destination. So addressing some of the cons to a degree. They do not have lecturers on board, but do have a very flexible dining program on land. Their price for the 2012 tour was $89,900 and an additional $4950 for a single room, so another choice. You can tell I am a fan of private jet ATW tours but with qualifications, this is not a trip for everyone. Let me know if you have been on one and your thoughts or questions!